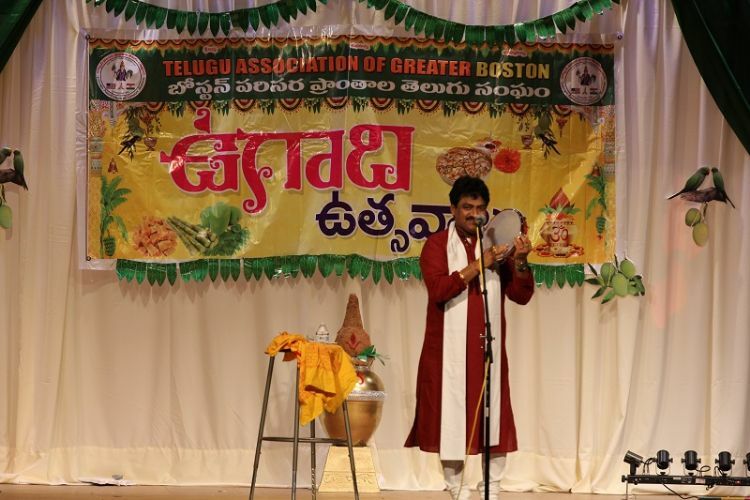 Telugu Association of Greater Boston (TAGB) kicked off the New Year 'UGADI ' UTSAVALU 2017' with a grand celebration on April 22nd (Saturday) at Algonquin Regional High School in Northborough, MA. Traditionally Ugadi event is dedicated to showcasing local talent that attracts large crowds in Greater Boston area. 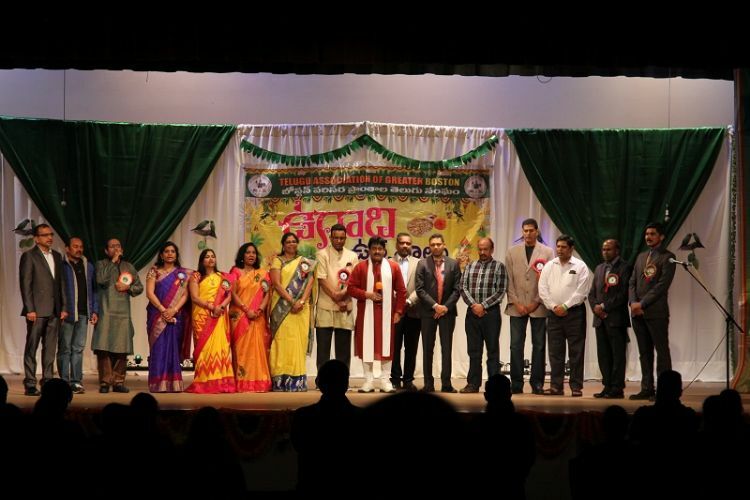 Alongside local talent, this year's Ugadi event featured various DhimTANA competitions and performance by well-known artist, Dr. Ghazal Srinivas as special attractions. About 1000 Telugu people from surrounding towns joined the event to partake in competitions, music, drama, dance, comedy and much more. The guests were cordially welcomed by the committee with traditional 'Ugadi pachadi' a symbol of Ugadi festival. TAGB's special crew dedicated to the decor of entrance, auditorium, hall ways, and stage did a fabulous job that earned lot of accolades, months of their effort truly paid off. 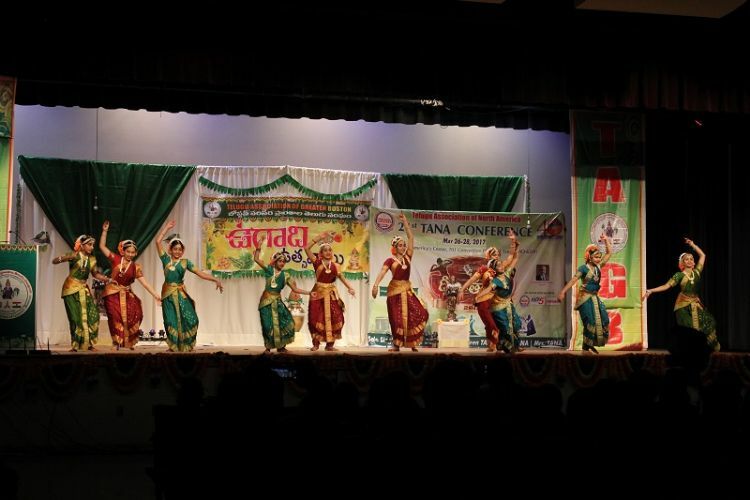 TAGB facilitated the DhimTANA competitions as part of Ugadi cultural program this year. The traditional 'Deepa Prajwalana' (lighting of the lamp) was followed by the American and Indian National Anthems, a fun filled afternoon started with DhimTANA singing competitions and Ugadi cultural programs. More than 200 participants performed in 50+ programs provided nine hours of non-stop entertainment. Captivated audience watched in awe as performers displayed their talents in classical and non-classical singing, classical and non-classical dances, enacting comedy skits, mono-action depicting Duryodhana, an epic character from the Mahabharata, and some very talented young musicians playing traditional tunes. Sincere efforts by parents to bring forth traditional values to the next generation were reflected in the quality and dedication of the superb performances. Cultural extravaganza started with a spiritual bliss as always with participants singing to the glory of Ganesha, Rama, Krishna and Sri Bhagavat Ramanujacharya before shifting to the first segment of dances to Tollywood tunes some of which were considered for DhimTANA auditions. Audience was amazed by the glittering performances. For the first time ever there were three skits performed, 'Balabharatham' which portrayed the adolescence of Kaurva and Pandava brothers in a way that could be easily comprehended by audience of anyway, 'Pa.Pa.Pi.Pi' which enlightened the audience with 'Neeti Sukthulu'(morals) with a comic twist and 'Dondu Donde' which entertained the audience with non-stop comedy. The unique combination of classical Kuchupudi, Fusion and Tollywood film dances enthralled the audience leading up to the signature event. Several performances portraying the Ugadi theme added to the festive tranquility. Commendable attempt by Deepti Gora's team, 'Kavitha Ghosti' ' recitation of poems, depicting six flavors of Ugadi, was well received by many literary lovers which bestowed our faith on how programs like these would be received. First ever 'Lion Walk' by men and youth, walking the ramp to peppy music was received with thunderous applause. Grand finale program of the evening by Ghazal maestro, Dr. Ghazal Srinivas who holds the Guinness World Record for most languages sung was simply memorable. He transported everyone back in time to their villages, green paddy fields and rich culture with his garland of ghazals. His grand finale ghazal on love for one's father touched everyone's heart. TAGB Competitions team introduced the unique competition of 'Poem Recital' this year and several enthusiastic children showcased their knowledge of age old Vemana and Sumathi satakalu. Prizes for DhimTANA vocal and dance competitions winners are also distributed. A Panel of distinguished judges for competitions are comprising of accomplished musicians and dance teachers of Boston area. The entire program is covered live by TV5 and MANA TV. Thanks to our food partners, Biryani Point for providing snacks and Mayuri Indian Cuisine for providing sumptuous dinner. Thanks to our supporter Nature fresh America LLC who brought in Alphonso, 'Banginapalli' mangoes to our guests was well received by our guests. No successful event is possible without the dedicated efforts and valuable time of volunteers. A big shout out to all the volunteers, who made this event happen. Their moto of 'live a life of service to others' was a hallmark of the event. Surreal efforts of emcees not only facilitated the event and ensured the smooth flow of multitude of programs, but also allowed the audience to relax and get involved in the night. In his presidential address, Sri Srinivas Batchu introduced new Governing Board team ' Board of Trustees, Sri Srinivas Kollipara (Chairman), Sri Sasi Kant Vallipalli (Vice Chairman), Sri Murthy Kanneganti (member), Sri Raja Chilakamarri (member), Sri Shankar Magapu (member), Sri Padma Parakala (member) and Sri Chandra Talluri (ex-Officio) and Executive Committee, Smt. Manimala Chalupadi (President Elect), Sri Pradeep Penubolu (Secretary), Sri Seetharam Amaravadi (Treasurer), Smt. Deepti Gora (Cultural Secretary), Sri Ramakrishna Penumarthy (Joint Secretary) and Smt. Satya Parakala (Joint Treasurer). He reassured the audience that the TAGB management team is focused on involving and collaborating with other charity oriented organizations. The forthcoming plan for this year also include strengthening the youth program and encourage young volunteers to participate and contribute to the community. In his closing remarks the President appreciated the spirit of the participants involved in the various cultural programs, competitions and sports championships. He thanked the audience for gracing the occasion and the sponsors for endorsing the organization over the years and felicitated Ghazal Srinivas garu in grandeur manner. The event concluded with vote of thanks by Secretary Pradeep Penubolu and Indian national anthem. The evening turned out to be an excellent social and networking event. The community has once again come together to display its strength and solidarity by making this event a grand success. The event is over, the applause subsided, but the joy and emotion are still lingering.